There are numerous everyday items that we scarcely ever think about yet must have been invented and developed during our history. Take the mattress, we all have one yet most people barely give them a second thought (unless of course theirs is uncomfortable and causing them to sleep poorly). Yet there must have been a point in history where someone first thought of sleeping on something more comfortable than the ground. Others have continued to improve on this concept until we reach today where we have a wide array of comfortable and supportive mattresses available. So what is the history of the mattress? The mattress is so commonplace that most of us do not even give it a second thought, yet it has an interesting and varied history, one that goes back thousands of years. Unsurprisingly, the first mattresses were made out of various natural items that were close to hand such as grasses, furs and leaves. It is believed that the first mattresses of this kind were developed during the Neolithic period (10,000-4000 BC). The next development occurred in Persia around 3600BC when they made the first waterbed by filling goat skins with water. The Romans used to fill skins with straw and wool a few thousand years later. There was no real innovation in the mattress for almost two thousand years after that with Renaissance era mattress still be made from skins and stuffed with natural fillers such as wool and hay. It wasn’t until the 18th and 19th century that people started to think seriously about the mattress, creating a variety of different synthetic fillers and developing other methods of support, with the spring first being added in the mid 19th century. 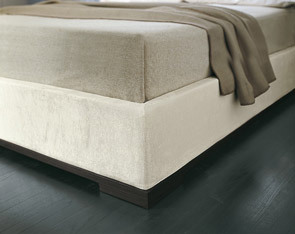 In 1926 Dunlop developed a latex rubber that would go on to become a staple mattress material. Finally, the latest mattress innovation occurred during the space race when NASA commissioned the design of an advanced support material for its astronauts. During the 1970s and 1980s this material was repurposed as memory foam, marking the latest and greatest milestone in mattress history. Mattresses have a long and fascinating history that shows humans have spent millennia perfecting their beds and the way they sleep.